Khun Suparat Kaewputtachart, Head of Sale of Bancassurance, TISCO Bank, and Working Group Committee, TISCO Foundation, presented a cart to Mrs. Thitivan Kuankid, Food Vendor, at TISCO Tower, on March 23, 2007. 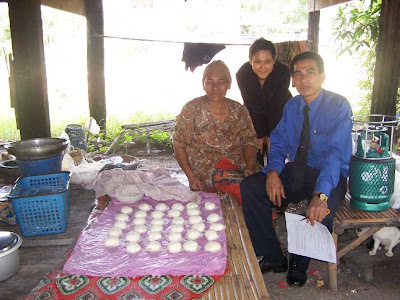 Khun Chalita Tantayanonda, Corporate Marketing Communication, of TISCO Bank and Working Group Committee of TISCO Foundation, presented a cart to Mrs.Somboon Arunpoonsap, Desert Vendor, at Ampur Nampraew, Chachoengsao on March 22, 2007. Khun Somboon has been granted a cart 8 years ago and is was unusable.